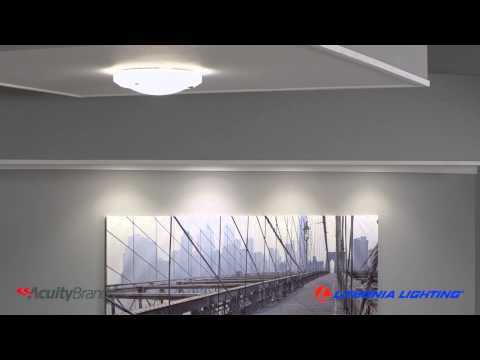 The 17" Sunbriar LED flush mount is ideal for use in closets, corridors, hallways, offices, bedrooms, stairways and many other light commercial or residential settings. This fixture can be left on for 24/7 operations and produces 1,300 lumens at 50,000 hours of life. Available in nickel and bronze finishes, the Sunbriar features a ribbed acrylic diffuser and painted metal housing with matching finial. Traditionally designed molded acrylic diffuser adds the flair of cut glass without the worry of breakage. All mounting hardware included. Works with most standard incandescent dimmers. Provides general LED illumination in residential and light commercial applications. Ideal for use in foyers, hallways, bedrooms, offices, utility work areas, stairways, and many other rooms in the house. Flush mounts are preferred on lower ceilings. Limited 5-year warranty.